With Joyce Banda in charge and with international donors returning, what are Malawi’s prospects for growth and stability? 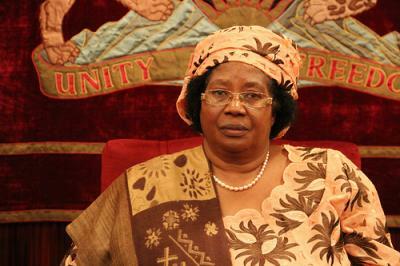 President of Malawi Joyce Banda. Photograph by Lindsay Mgbor/UK Department for International Development. Malawi is a country emerging from an unexpected political change. President Bingu wa Mutharika, Malawi’s leader of eight years, died suddenly of a heart attack in April and the torch passed to his estranged vice-president Joyce Banda. One of two female leaders on the continent, Banda brought members of People’s Party, which she founded in 2011 after falling out with Mutharika, into government with her, resulting in a wholesale change at the top-level of Malawi’s politics. And alongside Banda, another party was also brought back into the fold: international donors. Bilateral aid had all but dried up in the face of an increasingly authoritarian President Mutharika. Concerns over human rights abuses concentrated aid into the hands of NGOs, if aid was continued at all. The expiration of the Malawi Growth and Development Strategy in 2011 ensured the end of bilateral aid to a government whose own designs and implementation of development schemes clashed with those of international donors. With the accession of Banda to the presidency, Malawi is again at the centre of international aid attention. Yet with the president wooing back foreign donors, who is really pulling the strings of Malawian politics? Joyce Banda is a forceful personality. Her estrangement from Mutharika in recent years and the independent path that she has always followed, regardless of virulent criticism, demonstrates a strong will that transcends mere political expediency. Banda also has well-established development credentials; she instituted the National Association of Business Women in 1989, an NGO aimed at economically empowering women, and has founded various organisations which deal with women’s rights, female health and poverty. Banda symbolises a fresh brand of politics as was clear when she told the press that she is happy to be identified with the majority of Malawian women after the former first lady Callista Muthatrika’s dismissed her as a mere “mandasi seller”. Already in her short time as president, Banda has demonstrated a desire to break with the decisions of her predecessor. Actions such as the off-loading of the private presidential jet and fleet of luxury cars have been widely popular. Her focus on media freedom and rooting out corruption has been interpreted on the international stage as evidence of the sincerity of her focus on development. And decisions to overturn the ban on homosexuality and the refusal to hold the African Union summit rather than invite the International Criminal Court-indicted president of Sudan indicates that she is not afraid to incur displeasure. The manner in which President Banda has set about tackling Mutharika’s legacy in her first 100 days of office reveals independent political convictions. Despite Banda’s dynamic vision for her country’s future, her administration currently has to rely upon foreign donors. Malawi is one of the world’s poorest economies; an estimated 75% of Malawians are living under the poverty line and the country’s population is expected to double to 26 million by 2030. Demand for Malawi’s principal exports of tobacco, tea, sugar and cotton has also been falling in recent years. Tobacco in particular has suffered due to a poor harvest and global campaigns to decrease tobacco consumption. Without international capital, Malawi has little hope of creating a sustainable economy. Malawi is therefore heavily dependent on foreign aid, and many of Banda’s recent policies are likely to have been made with at least one eye on donors. President Banda acknowledged herself that the decision to refuse the African Union summit was based partly on the reactions of international donors. Similarly, Banda’s devaluing of Malawi’s currency the kwacha – something Mutharika steadfastly refused to do, to the annoyance of donors who consequently reduced aid – was done at least in part to ensure International Monetary Fund (IMF) backing. Given Malawi’s weak trade sector, it is unlikely devaluation was implemented solely based on an appraisal of Malawi’s economic position. These policies have certainly been effective in drawing foreign aid back into Malawi. The UK has pledged £23 million ($36 million) for the stabilisation of the Malawi economy, and a further £10 million ($16 million) to boost healthcare. Meanwhile, the US has recently restored a $250 million assistance programme in the light of perceived good economic and political governance. Similarly, the IMF has granted $156.2 million under the Extended Credit Facility for the next three years. Encouragingly, Malawi’s current situation under Banda appears to exhibit some of the characteristics of the Paris Declaration on Aid Effectiveness (2005). Although the declaration’s primary concern was to regulate and increase the effectiveness of aid, it also sought to synchronise the development channels of national governments with bilateral and multilateral donors. The convictions of President Banda and the aims of international donors appear to be broadly in alignment. Despite this, however, aid dependency is and will continue to be a critical issue for Malawi, and the Paris Declaration also aimed to see development driven by organic indigenous growth rather than simply through foreign gift packages. This is a problem for Malawi not only because dependency potentially inhibits political independence, but also because aid is not secured in perpetuity. As the IMF has recently warned Malawi, financial difficulties in donor countries has made it harder to justify aid, and the UK has already indicated its desire to see its relationship shift from aid to trade. Banda is trying to tackle this. In a speech given on May 18, Banda outlined her plan for economic development, emphasising three focal points: austerity and rigour at the governmental level to curb corruption and an inefficient bureaucracy; increasing agricultural productivity, including plans for genetically modified crops and a water development programme; and a commitment to women’s rights that encompasses the economic and political empowerment of women in Malawi. Some emphasis was also given to attracting foreign investment, particularly through the expansion of the tourism industry. Alone, this may not be enough. Some, for example, rightly argue that Malawi will also need to diversify its economy before it can be independent of aid. Nevertheless, Banda clearly has a vision of a stable and sustainable future. And with her at the helm, and with international backing once again, Malawi’s prospects for tackling the significant economic hurdles and difficult political challenges in its path seem more promising than they have for a while.